Robert Reiniger Meredith Willson was born in Mason City, Iowa on 18 May 1902. 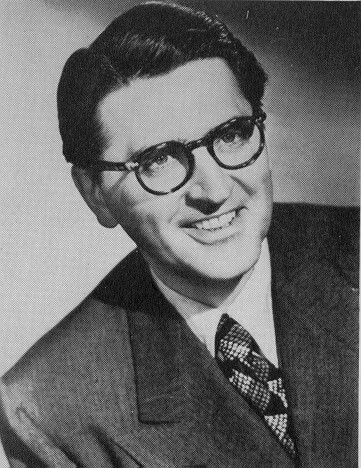 Meredith Willson was educated at Damrosch Institute of Musical Art (now known as The Juilliard School). He was a flute and piccolo player. Willson was the solo flautist with John Phillip Sousa's band from 1921 to 1923 and he played flute in the New York Philharmonic under the direction of Arturo Toscanini from 1924 to 1929. Willson was concert director for KFRC in San Francisco and then became the musical director at NBC first in San Francisco and then Hollywood. As musical director / conductor, Willson is known for his work on the popular radio programs: Carefree Carnival (1933-1936), Maxwell House Coffee Time (1940-19) and The Big Show (1950-1953). He wrote the theme song for Maxwell House Coffee Time - "You and I" which became a number one hit. He also wrote "May the Good Lord Bless You and Keep You" as the show closer for The Big Show. Willson scored Chaplin's The Great Dictator and Hellman's The Little Foxes. He was a Major in the U.S. Army during World War II and was the Musical Director for the Armed Forces Radio Service. Meredith Willson's The Music Man opened on Broadway on 19 December 1957 and went on for a 1375 performance run. The cast album won the very first Grammy Award ever presented. The Music Man won eight Tony Awards with Willson winning for Best Musical Author and Best Composer and Lyricist. The movie version won the Academy Award for Best Musical Score. Willson also wrote The Unsinkable Molly Brown, which opened on Broadway in 1960 and Here's Love (a musical adaptation of Miracle on 34th Street) opened on Broadway in 1963. Willson's song "It's Beginning to Look a Lot Like Christmas" written in 1951 and made famous by Perry Como was used in Here's Love. Beatle Fans may remember Paul McCartney singing the love ballad "Till There Was You" (a song from The Music Man) on their 1964 album Meet The Beatles. Willson also wrote the University of Iowa Fight Song. Meredith Willson died in Santa Monica on 15 June 1984 at the age of 82. Copyright © Michael L. Van Blaricum, 1999-2009 -- All rights reserved.